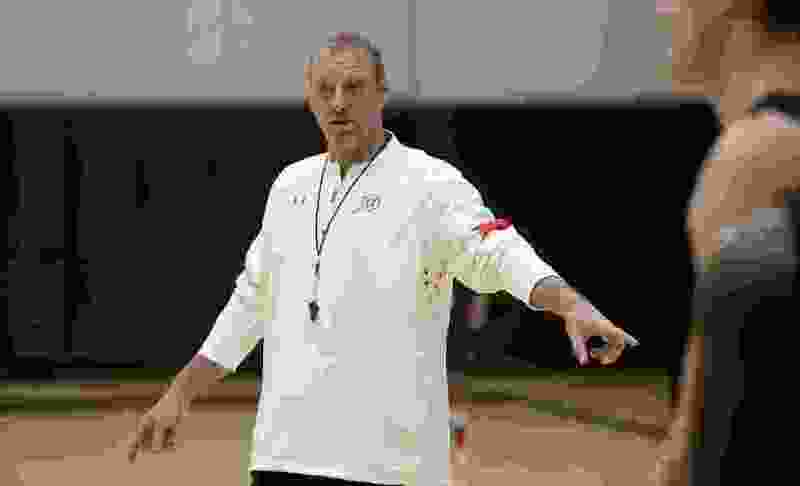 (Francisco Kjolseth | The Salt Lake Tribune) Utah coach Larry Krystkowiak pushes his team through drills as the Utah men's basketball program begins fall practices with a fairly new roster of players on Friday, Sept. 29, 2017. Larry Krystkowiak’s summer has been anything but a break. Not that it ever was before, but when change hovers over a program, as it has under Krystkowiak in recent seasons, you have to get your batch of newcomers up to speed. This summer his Runnin’ Utes welcomed five members of a lauded freshman class who will be leaned upon to not only contribute, but be integral parts of a program in its eighth season under the watch of the 53-year-old head coach. During the start of the few weeks of the offseason — student-athletes will return to campus when the fall semester starts on Aug. 20 — Krystkowiak was in the middle of a lengthy drive back to his home state of Montana when he discussed a number of topics regarding these young gun Utes, the vaunted nonconference schedule pieced together for the upcoming season, and what expectations he has for such a youthful squad. It started this summer not on the court, but in the weight room. Utah’s loss to Penn State in the NIT final in late March served as a lesson for Krystkowiak’s group that while the 2018-19 team will be stocked with young talent, it must be ready for what will be a significantly upgraded schedule. The Utes struggled physically against Penn State, so this summer, it has been all about bulking up. “We’ve given our strength and conditioning staff the direction to, ‘Hey, let’s put some beef on,’” Krystkowiak said. Utah was able to practice four hours a week for eight weeks during the summer semester, which is made a bit more tricky considering coaches are recruiting as much as five days a week. When the coaches were on the road, the Utes were turned over to the training staff in the gym. And when you have five new freshman plus some JC transfers, you’ve got a lot of paperwork to sort through just to get off the ground. Which Krystkowiak feels Utah’s on target with. No spring or summer during his seven previous years was as fruitful or productive as this one, he said. The 2018 class of guard Naseem Gaskin, wings Both Gach and Timmy Allen and bigs Riley Battin and Lahat Thioune has acclimated. Transfer guard Charles Jones Jr., last year’s NJCAA Player of the Year, has too. Utah’s 2018 and 2019 recruiting classes are their most hyped to date, so what, if anything, has changed? “A lot of things in life don’t happen overnight,” Krystkowiak said. Plenty has changed, but also, not that much. Utah has been in the Pac-12 long enough now, Krystkowiak says, that it has produced star players (see Delon Wright, Jakob Poeltl and Kyle Kuzma), contended for conference titles and even added that spiffy new basketball facility to wow recruits. Utah lost four seniors to graduation and five more to transfers after missing out on March Madness. Fans might be drooling over the potential, but potential isn’t quantifiable. For Krystkowiak, outmuscling the other dude for a rebound, or soaring just a bit higher to block a shot is. Utah, as it is every year, has completed its first phase of the calendar year. Senior Parker Van Dyke said as much when the team held its last squad meeting at the conclusion of the summer semester. “You can never win a golf tournament on a Thursday,” Krystkowiak summed up. But you can certainly put yourself in position to. That’s why Utah’s nonconference schedule, which for some time has been scrutinized by fans and media, has been bolstered. Utah hits the road for games at Kentucky and Minnesota, faces rival BYU at Vivint Smart Home Arena in the Beehive Classic, and hosts the likes of Tulsa and last year’s Sweet 16 team Nevada. Why has Utah loaded up for this season? “Sometimes, your mindset changes a little bit,” Krystkowiak said. If Utah’s in the mix for an at-large bid come next March, there won’t be any questions regarding the bubble. Beyond that, a trip to Rupp Arena or facing a veteran-heavy Wolfpack team will ensure the annual road trip at Arizona isn’t an eye-opener for this young Runnin’ Utes crew. The Utah coach didn’t want to single out any player when asked who has turned heads or who is exceeding expectations this summer. But Krystkowiak does believe he’s got a bunch of players who are willing to guard, and as far as length and athleticism, well, there’s never been a previous team that has rivaled this year’s roster. They’ll be tested this upcoming season. All of them. And it’ll start early in November, not January.